You might spot Danai Gurira, Lauren Cohan, Lee Daniels, Winona Ryder, and Jennifer Lawrence around town this month. 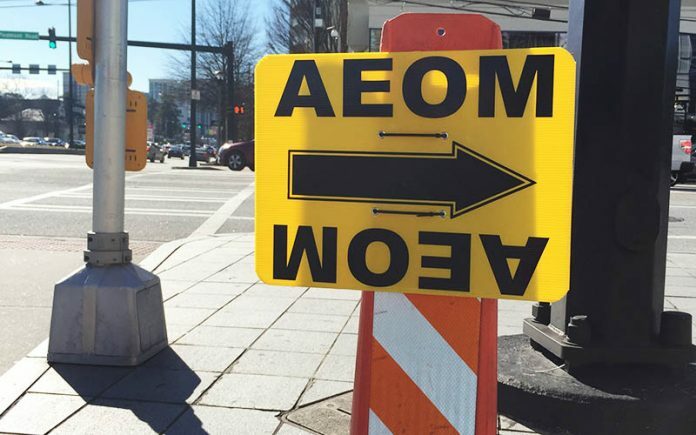 An AEOM sign for All Eyez On Me sits at the intersection of Peachtree and Piedmont roads on January 18. Now that the holidays are out of the way, we’re starting to see more and more movie and television projects return to life in Atlanta and the surrounding communities—some new, some held over from December. January is typically a slow month in the film industry, but don’t let the lull fool you—we’ve got a slew of movies gearing up in the coming months. The Tupac Shakur biopic, All Eyez On Me (production code: AEOM), was by far the most visible project during the past month. Just before the holiday break, crews worked in Douglasville, and the film continued to shoot there in early January. Last week, filming took place in Duluth near Berkley Lake Road and Peachtree Industrial Boulevard. From January 15 through 18, signs were posted prominently in Buckhead at Peachtree and Piedmont Roads. Most recently, Pickneyville Park in Norcross was used for the film. All Eyez On Me stars the relatively unknown actor Demetrius Shipp Jr. playing Shakur, as well as two Walking Dead cast members, Danai Gurira (Michonne) and Lauren Cohan (Maggie). Star (ULDMP), a spinoff to Fox’s hit show Empire, recently began production. Like Empire, Star is helmed by Lee Daniels. It will follow a trio of girls (from Atlanta, of course) who come together to form a band and try to make it to the top of the music business. Benjamin Bratt, Queen Latifah, and Nicholas Gonzalez are all currently attached. On January 7, crews were spotted downtown. After that, a basecamp was set up in Buckhead at the Gold Room from the January 12 through 14. Filming took place at the club on January 13. Since then, production has moved to Midtown. Keep an eye out for this one in the coming month, and hopefully a lot longer if the show gets picked up. The Originals (TOGS), the Vampire Diaries spinoff now shooting its third season, was also fairly active over the slow winter month. As usual for this show, filming mostly took place in Conyers. On January 15, however, they came to southwest Atlanta near Stephens Street at Collier Metals. Elsewhere on the television front, Fox’s Sleepy Hollow (SH) was in Milton on January 20. The Netflix Winona Ryder drama Stranger Things (ST) filmed at Emory’s Briarcliff campus in early January, as well as in Palmetto last week. Devious Maids (DM) just started shooting its fourth season on January 18 in Stone Mountain. Oprah’s Greenleaf (GL) was spotted on North Avenue on the 20th shooting a food truck scene. On January 9, the indie film Hot Summer Nights (HSN) reshot a scene in Fayetteville. We also saw the Jennifer Aniston war flick The Yellow Birds (TYB) in Covington right before Christmas. Jennifer Lawrence and Chris Pratt’s Passengers (PLASS) is still shooting in Fayetteville, although production is drawing to a close. We also had a blast from the past when The Founder (SPEEDEE, LLC), the Ray Kroc biopic starring Michael Keaton, reshot on January 14. As for what to expect in the year ahead, Miles Teller and Haley Bennett will come to town for Thank You For Your Service in February. Also next month, look for Ashley Judd and Bill Paxton for Life Briefly. Chris Pratt, Zoe Saldana, Dave Bautista, and Benicio Del Toro will also join the mix for the latest much-anticipated Marvel film shooting in town, Guardians of the Galaxy Volume II. Later, look for Being Mary Jane’s (SNC) fourth season, the next Fast and Furious movie, Fast 8, and the conclusion of the Divergent series, Ascendant. And if you still can’t wait for more Atlanta-filmed goodness, here are a few trailers for the locally filmed Dirty Grandpa (in theaters January 22), Neighbors 2: Sorority Rising (in theaters May 20), and Triple 9 (in theaters February 26).